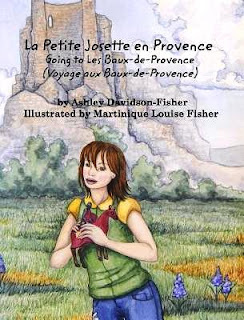 The author of La Petite Josette En Provence is Ashley Davidson-Fisher. We follow each other on Twitter and I've enjoyed her photos of Provence (and this summer, Norway) for quite a while now. She's lived in Provence, off and on, with her family for many years and still does. 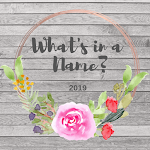 She asked me if I would read and review her new children's book, La Petite Josette En Provence, which has been illustrated by her daughter, Martinique Louise Fisher, and naturally I was very pleased to do so. La Petite Josette (little Josette) is incredibly excited. Her parents are taking her and her older sister, Anne-Laure, out for the day to visit the hill-top village of Les Baux-de-Provence. She's so excited that when her sister comes to collect her she's already dressed under the bedclothes! The girls help their parents get the picnic ready and load the car and they're off. 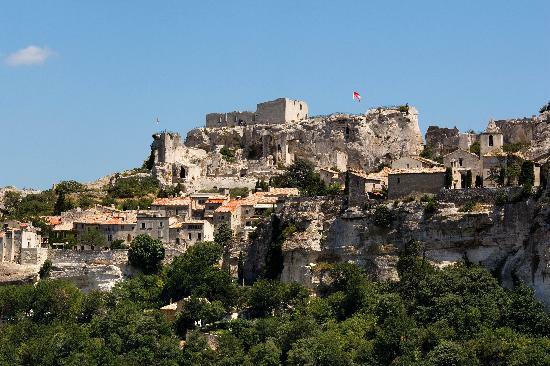 This is Les Baux-de-Provence, (pic from TripAdvisor) which as you can see, is rather spectacular; it has a medieval castle, a very ancient history, and by the sound of it, lovely shops and cafés. I gather it's been named one of the most beautiful villages in France. Anyway the family set about exploring the castle, enjoying a picnic, buying souvenirs and having a reviving drink. In other words a really lovely day out. This children's book is pure charm. Ashley's beautifully written story is also superbly illustrated by Martinique Louise Fisher. To be honest, the illustrations are a real feature of the book, I sat looking at them for ages. Her website is here if anyone is interested in seeing her work. The paintings in this book made me wish adult books came with pictures like this! How nice to see exactly what the storyteller has in mind. But not only is the book charming it's also educational. I did French at school and although I haven't kept it up the knowledge is still part of me and I didn't have too much trouble understanding the French. What I didn't know was explained in the story so I feel like I learnt quite a bit. For instance, we're all familiar with the French 's'il vous plait' for 'please'. I've always wondered what families say for this because they wouldn't use 'vous' they'd use the more personal 'tu'. Apparently families say, 's'il te plait'. So now I know. A simple thing but it pleases me. I learnt that sausages are 'des saucisses', peanuts are 'cacahvétes', fab word but my keyboard won't do the accent the other way round, and yoghurt is 'yaourt'. I think this would be an excellent book for children just starting to learn French or perhaps with a little experience of the language. (My grandson has just started in fact, he did a little at primary school but has started in earnest at comprehensive and loves it.) French makes up a small percentage of the story and there are clear explanations in dialogue for all of the French terms. I really really hope that Ashley and Martinique are thinking of doing more books about 'La Petite'. I think it would be a gorgeous way to introduce children to the language but also to the beauty and culture of La belle France. And not just children... aged grandmas with a thing about European geography too. Thank you so much, Cath, for writing such a beautiful review! I love it and I'm so pleased you liked the story and my daughter's gorgeous illustrations! She really brought to life La Petite and her family. It's nice to hear that you learned some knew French words and ways to say things in French. My objective with this book is to give people a gentler way to see, hear, and speak the language and learn new words and at the same time see a bit of one of the most beautiful villages in Provence. I hope that objective was met. Thank you again and I am so pleased you liked it! The do say that the best time to teach a child a new language, is from 2-3 years old and I can see Ashley's books being really good for that, as they are just right for parents or teachers and children to share. I do hope that Ashley decides to continue the adventures of Josette and her family, into a series. In these days of ever growing multi-cultural societies, I am always amazed at the consummate ease with which children can switch between languages in an instant, when like yourself, my limited French is a product of my long ago school days and is not very difficult to find extremely lacking, very quickly in much more than a very basic conversation! The book alone, whilst good, is clearly made excellent by Martinique's amazing illustrations, so a collaborative partnership is definitely the way forward for a 'Josette' series. I really like what social media platforms have to offer when friendships are formed, like the one between yourself and Ashley. It is just such a shame that there always has to be individuals or groups of individuals, who are hell-bent on turning something good into something bad, for their own selfish ends! Thank you so much for your nice comment on the book and my daughter's illustrations. She is, indeed, very talented and I had such a wonderful time creating the book with her. It's quite possible that a series for Josette could be in the works :) We shall see! I'm very pleased to say that I've heard from quite a few people asking about that. Cath's review was just beautiful! Social media can, indeed, be a wonderful thing. 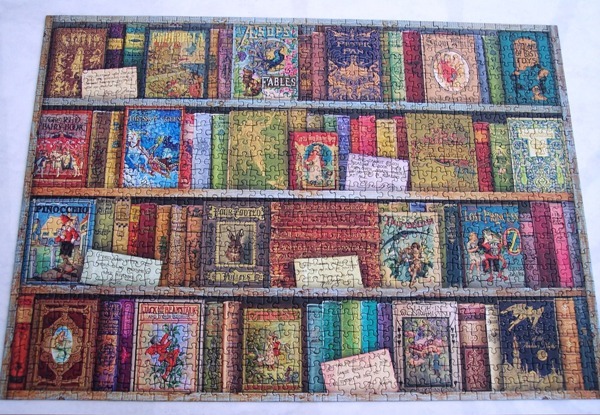 She and I "met" because of our love of travel, books and puzzles! Life is full of fun, kind, and interesting people and it's just amazing to be able to share the love of different things with those who you might never have met if social media didn't exist! Thanks again Cath, for your lovely review! Sorry to be a while answering your comments, ladies, I've had nasty throat infection for four or five days which has made me feel rather under the weather. Ashley: You are most welcome, I'm so chuffed that you're so happy with the review. Hopefully lots of people will see it and order it. I love the idea of 'gently' learning another language and I really do think that you and your daughter succeeded in your aim. I'm so pleased to hear of the possibility of more adventures with La Petite... can't wait. Good luck with your venture. Social Media comes in for a lot of criticism, sometimes deservedly so, but if used properly with respect for other people's feelings it can be a huge force for good I think. I've met so many lovely people, not just through social media but also since I first went online in 1997. People I have actually met and who're part of my life now and hopefully always will be. And one of those people is Yvonne here. Yvonne: Thank you so much for your lovely comment, you're always so thoughtful in what you say. I totally agree about social media. I've seen some awful things, people saying things to others that they've never met and don't know anything about. I try my level best to keep out of it, for me Twitter and FB are for making friends with similar interests not for screaming abuse at someone whose political opinion is different to your own. What a pointless exercise! I hope you're enjoying the much cooler weather... I certainly am. Sounds charming. Sadly no young children in my extended family right now but I'll keep it in mind.